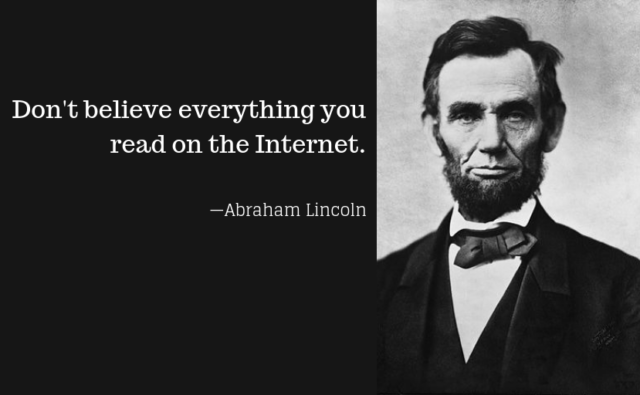 Abraham Lincoln once said you can’t believe everything you read on the internet – at least there is a meme floating around to that effect. While quick access to a world of information is one of the miracles of our age, it comes along with the quick dissemination of falsehood and rumors as well. If discernment was a gift most people had, the website Snopes.com would not have much business. So it always pays to investigate the veracity of internet proclamations, especially if the author has an axe to grind. For instance, did you hear about the gold-plated healthcare plan that Members of Congress have? Or what about their mail privileges? Or what about how Congress skirts having to pay into Social Security? Or if a Member of Congress serves one term they get a full pension for life? We’ve heard them too, but these are examples or rumors, exaggerations and some outright lies. You might have seen these in an email forwarded from a friend or neighbor or maybe you clicked on a link on social media. No matter where you saw these statements, they’re false. Wrong. Inaccurate. Misleading. Completely not true. What’s more amazing than the fact that these myths exist is the speed at which they spread. Congress has enough problems without having to make things up. Below are some of the most well-known myths and the real facts. Knowing what’s true and what’s not will help citizens make informed judgments about whether Members of Congress are faithfully fulfilling their duties to the public. Myth: Members of Congress have a special healthcare plan that is better than anything the average American can get. Fact: Members of Congress are subject to the Affordable Care Act, also referred to as Obamacare. It’s actually written into the law – Section 1312 (P.L. 111-148) states that the Federal Government may only offer Members of Congress and staff plans created under the law or on an exchange created by the law. In other words, Members of Congress and their staff must use an Obamacare plan, unless they receive health care via a spouse’s or parent’s plan or otherwise purchase one without the government contributing to its premiums. Members of Congress may not participate in the Federal Health Benefits Program, in which most federal workers participate. If a Member of Congress or staffer purchases insurance through the DC Health Link exchange, the government – as with many other employers – will pick up a share of the cost. Congress employs an Attending Physician, who is assisted by a medical staff. The physician is traditionally an officer in the U.S. Navy. The Attending Physician’s office provides on-site health services to Members of Congress, the Supreme Court, staff members, official visitors and the tens of thousands of tourists coming to the U.S. Capitol each year. Lawmakers may receive non-emergency care, but they pay an annual fee for this. The Office of the Attending Physician was created in 1928, in response to the realization that medical care for Congress was inadequate. In December of that year, three Representatives suffered medical emergencies – one fatal – but hours passed before doctors arrived. Keep in mind that the Attending Physician’s office also responds to medical emergencies for tourists and other guests in the U.S. Capitol Building. Myth: Members of Congress don’t contribute to Medicare. Myth: Members of Congress have a free gym. Fact: Like many workplaces, Congress has an on-site gym that Representatives and Senators can use – for a fee. It is true that federal dollars have been used for the gym, since Congress’ facilities are upgraded and modernized through its own budget. But Members do not have free access to the gym. Myth: Members of Congress do not contribute to Social Security. Fact: At one point in time, this was true. But Congress fixed this in 1983 with the passage of Public Law 98-21 requiring not just Members of Congress but all federal employees to pay into Social Security. That’s right – before 1984 (when the law took effect), no federal employee paid into the system but they also were not eligible to receive any benefits from it. Prior to this law, all federal employees paid into the Civil Service Retirement System, which was eventually replaced by the Federal Employees’ Retirement System (FERS). Myth: Members of Congress receive a pension equal to their full salary after a year of service. Fact: Wrong. A Member of Congress may draw a pension after five years of service. The size of the pension payment is determined by a formula that considers the average of the three consecutive years in which the Member’s pay was highest and their years of service. While in office, the Member must contribute a portion of his or her salary to the pension plan. Even then, they cannot start receiving benefits before the age of 62 unless they have served more than 20 years and are at least 50 years of age. The overwhelming majority of Members of Congress are covered by the Federal Employees’ Retirement System (FERS), which, as the name suggests, is a plan for those who work for the government. Compensation under this plan includes Social Security, a pension, and the Thrift Savings Plan, which is like a 401(k) plan. FERS is the only plan available to Members who were elected beginning in 1984. It is also the same plan that is available to every federal employee. Members elected prior to 1984 may participate in an older Federal retirement plan called the Civil Service Retirement System (CSRS), which provides a pension. The pension is more generous than that offered under FERS, but CSRS also lacks the 401(k)-like Thrift Savings Plan. Myth: Members frequently vote to increase their own pay. Fact: One of the popular internet posts about Congress states that Members of Congress’ salary increases should be limited to 2.5 percent of their pay or the cost-of-living, whichever is higher. This creates the impression that Members of Congress are voting themselves pay raises willy-nilly, which is laughable since congressional pay has not been increased for the last ten years. Myth: Members of Congress can send mail for free. Fact: Each Member’s office operates under its own budget, and part of that budget covers mail costs. Official mail sent from the office of a Member of Congress is sent by affixing a Member’s signature (or a copy of it) to the envelope in lieu of a stamp like you would buy at the Post Office. The frank may only be used for official correspondence – responding to constituent letters, anything involving constituent casework, letters to federal or other governmental agencies, and other uses – even things like holiday greeting cards to constituents are illegal. (If you do receive a holiday greeting from your Federal representative, it has been sent from his or her campaign office). Congress has passed legislation regulating franking that clearly says the privilege “may not be used for, the transmission…of matter which in its nature is purely personal to the sender or to any other person and is unrelated to the official business, activities, and duties” of Members. The law also requires that Congress reimburse the Postal Service for franked mail. The Committee on House Administration’s Franking Commission and the Select Committee on Ethics in the Senate oversee franking activities for their respective Chambers. The U.S. Congress isn’t the first governmental body to use franking. The British House of Commons instituted the practice in 1656. The Continental Congress adopted the practice November 1775, as did the Congress under the Constitution in 1789. Myth: Members of Congress do not need to pay student loans. Fact: Members of Congress are responsible for paying for their student loans. The House and Senate have programs that contribute toward the repayment of loans for lower-paid congressional employees, but Federal law excludes Members of the House and Senate from participating. This program is similar to ones found throughout the private sector as an employee perk. Congress, unlike the rest of the Federal Government and most large employees, does not have a tuition reimbursement program, and ethics laws prohibit Members from taking college courses without paying full tuition. Myth: Members of Congress get free housing. Fact: Members of Congress do not get free housing. Formerly, they could deduct $3,000 from their income taxes for business expenses, but it was repealed with the passage of the Tax Cuts and Jobs Act. Federal law states, “amounts expended by … Members within each taxable year for living expenses shall not be deductible for income tax purposes.” It is true that some Members will sleep on their couches in their office so as to not have to pay for a second residence away from home, but this practice is frowned upon by numerous watchdogs and even other Members. Myth: Members of Congress get free travel anywhere in the world and frequently travel in military planes. Fact: Members do not get free travel back and forth to their districts, though they do have a budget for their official travel (clearly defined by the ethics rules). They are not transported back and forth to their districts by the U.S. military. Each Member’s and Senator’s office receives an annual budget that covers all official costs – that includes appropriate reimbursement for airfare, lodging, rental vehicles, fuel, meals, and other travel-related expenses for both lawmakers and staff. This is the same policy followed by nearly every company in the private sector. The budget covers all office expenses such as rent, salaries, cell phones, technology, office supplies, etc. When groups of Members travel internationally for official business, it is called a CODEL. CODELS must be bipartisan and must be for specific reasons. These are not “junkets” paid for by private interests – ethics rules prohibit this. Members may use military transport on some CODELs, depending on where they are going and how safe the destination is. Private entities may cover costs for some trips related to official business, but these trips must be approved by the Ethics Committee in the Member’s Chamber. Myth: Members of Congress get bodyguards and drivers courtesy of our tax dollars. Fact: The average rank-and-file Member of Congress does not have security protection outside of the Capitol. The U.S. Capitol, House and Senate office buildings, and the entire campus is protected 24-7 by the U.S. Capitol Police. Two Capitol Hill police officers were killed by a deranged gunman attempting to attack Members of Congress in 1998 leading to increased security getting into Capitol offices. Security also increased in the wake of the attacks of Sept. 11, 2001 and the anthrax attacks on Congress the next month that resulted in 5 deaths and 17 other anthrax infections. There are 10 positions in Congress that do receive protection from the Capitol Police – the Speaker of the House, the Senate President pro tempore, Majority and Minority Leaders and Majority and Minority Whips in each Chamber. These positions are referred to as “leadership.” The Speaker of the House, of course, is second in line to the Presidency, and the President pro tempore of the Senate is the third. The only way another Member will receive protection from the Capitol Police is if there is a credible threat against him or her. In fact, Members of Congress have been victims of attacks outside the Capitol. Former Representative Gabby Giffords was shot at an Arizona shopping center in 2011. Republican Steve Scalise was shot at a practice for the Congressional baseball game. As the Majority Whip, he had a security detail that engaged the gunman until local police arrived. Had Scalise not been at practice that day, the gunman would have been able to shoot twenty Members of Congress as well as staff, since no other Member had security protection. Most Members take threats against their own lives in stride but become very upset at the threats made to young staff and interns by malicious callers. The U.S. Capitol Police works with local police to alert them to credible threats. Similar to not receiving police protection, Members do not get drivers. They may choose to designate a staff member to drive them around their districts but that is out of practicality. When traveling between meetings and events, Members frequently catch up on emails, phone calls and paperwork. It is always safer for them to have someone else driving the car.